Which version should I use for my project? If I develop using TeeChart Pro .Net version, later on I want to change to TeeChart Pro ActiveX version. Does my source code still compatible with TeeChart Pro ActiveX version? How is the comparison about performance between using TeeChart Pro ActiveX and TeeChart Pro .Net for developing application in .Net framework 2.0 SP1? Could you please feedback me soon? For developing with .NET Framework we strongly recommend using the C# native version which is TeeChart for .NET. You'll have to change your project's references, TeeChart components at designtime and do some little code changes to adapt one version syntax to the other. TeeChart's architecture is identical. We don't have specific results and may depend on usage but in general .NET Framework is known to be slower than Win32 so we think the ActiveX version should be a little bit quicker than the .NET version. If you have any specific needs we can try to do some tests here. Thanks a lot for your prompt support. About #3, I would like to clarify one more point: in our case, we have to develop an application that will be compiled into .NET managed code, however TeeChart Pro ActiveX is win32 based component, which means COM Wrapper mechanism must be used in our application. As our understanding, using COM Wrapper to bridge between managed code and un-managed code will have some performance penalties. 1. We will have performance penalty of using COM Wrapper. Totally, if we use TeeChart Pro ActiveX version in .NET framework 2.0 application, our application will run faster or slower? We wonder if we should pass all data to TeeChart for processing and optimizing itself or we should optimize data by reducing number of data points before passing data to TeeChart? Given your requests I have done the test below which plots 8 series with the given number of points for an ActiveX and a .NET chart. ActiveX version proves to be much quicker (between 10-15 times faster). You can try running the code at your place to see how it performs exactly on your environment. On our side, we will investigate if this .NET code can be speeded up. If you process data before passing it to TeeChart it will render more quickly because it won't have to do this processing and won't have to draw so many points. Anyway, TeeChart includes data optimizing features as you can see in the All Features\Welcome !\Functions\Extended\Reducing number of points examples at the features demo available at TeeChart's program group. This feature is supported for both .NET and ActiveX versions. BTW: You may also be interested in reading the Real-time Charting article here. From your investigate, the ActiveX version proves to be much quicker than the .NET version, why we should use TeeChart for .NET instead of TeeChart for ActiveX? 1. 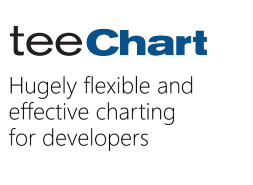 If you are developing .NET Framework applications, TeeChart for .NE v3 is a 100% native component suite. 2. TeeChart for .NET v3's 100% C# managed source code is available as an option. TeeChart Pro v8 ActiveX's sources are not available as it is a COM wrapper of TeeChart Pro v8 VCL.